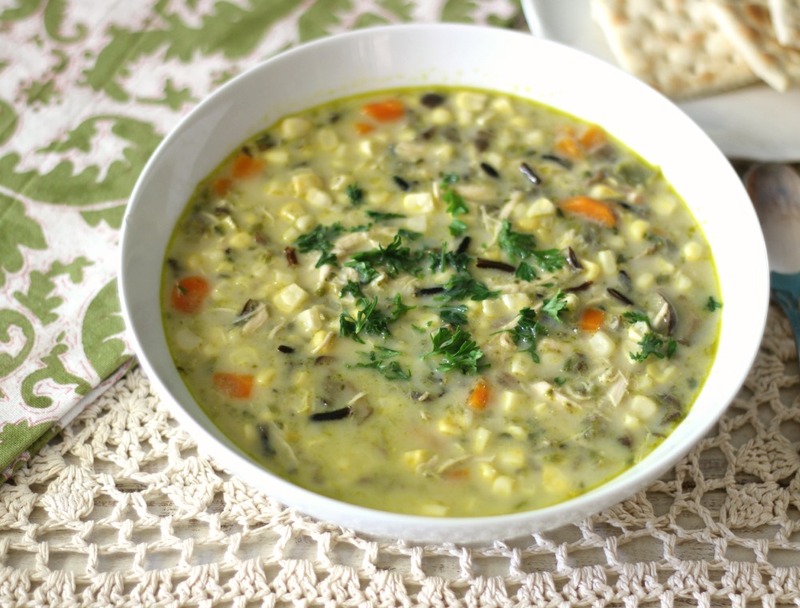 So for today’s “Make the Switch” recipe I have for you the perfect fall recipe, Corn Chowder with Wild Rice. This soup is just amazing. It’s creamy, filling, low-calorie, lots of vegetables and it has a slight kick of heat from the peppers and the best part a huge hit with the family. This was the first time they ever had corn chowder. Really? They have been missing out. When I told them what I was making I got ehhh, but then they had it and they couldn’t stop eating it. Needless to say I didn’t have leftovers. That’s when you know you made a recipe right! To make the soup I used fresh corn from the husks, but you can always use frozen too. Then I added carrots, mushrooms, onions, Pasilla Peppers, and jalapeno peppers. Yum!! Then I added some chicken broth, water, wild rice and to end the meal I used already cooked chicken. I cheated on the chicken and bought a rotisserie chicken. That made this recipe super easy. 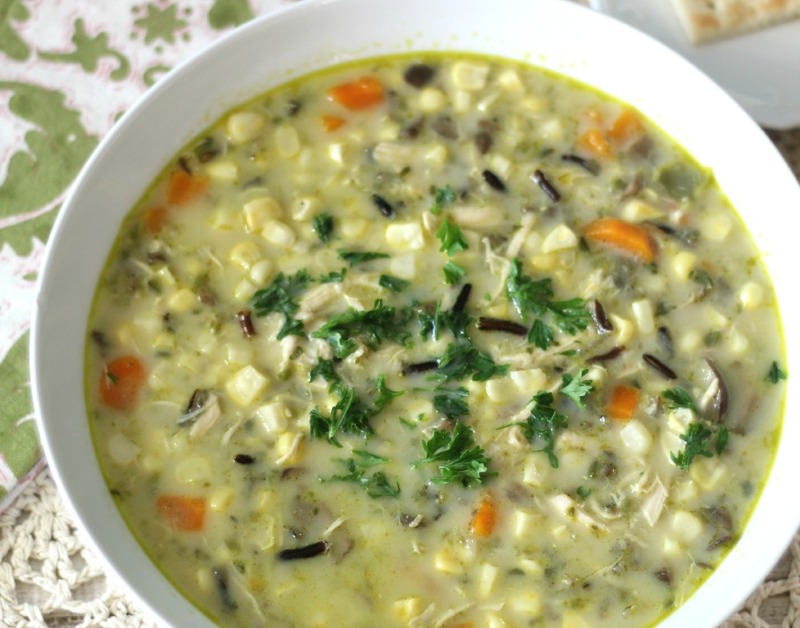 The cooking time is roughly an hour and you get 10 cups of this beautiful soup. Oh and get this only 137 calories a cup. Who loves ya baby? I entered this recipe to the Whole Grain Council to win a trip to Boston in November. I have been to Boston once and I hope to make it there again. It’s such a beautiful city filled with so much history and wonderful food. Plus I can win cash prizes! So I need your vote! But really, try the recipe and let me know what you think. I want your taste-buds to choose the winner of this contest, not popularity. 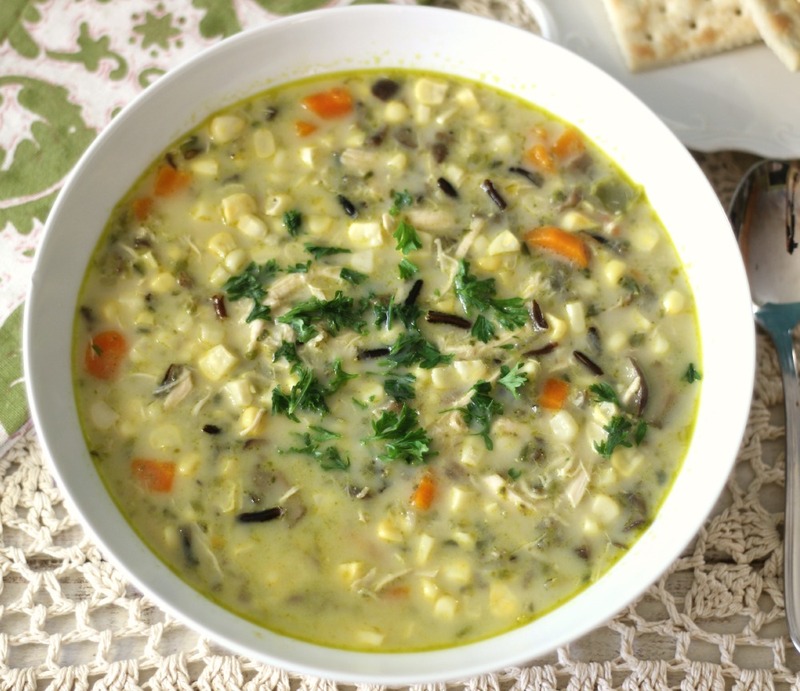 A rich, thick, creamy, hearty soup made with fresh corn, vegetables and has a slight kick of heat from peppers. Perfect for a weeknight meal and only 137 calories a serving! In a large pot, add olive oil, carrots, onions, Pasilla peppers and jalapeno peppers. Saute until slightly tender, about 5 minutes. Add mushrooms and cook for 4 more minutes. Pour in chicken broth and corn. Bring to a boil and simmer for 1 hour. Meanwhile, make the rice, by adding wild rice and water into a large pot. Bring to a boil, cover and simmer for 50 minutes until puffy. Drain out any water. Set a side. In a small bowl, add two tablespoon of water and 1 tablespoon of cornstarch; mix until smooth. Pour into chowder. Stir until thick, a couple of minutes. Stir in wild rice, chicken and half and half; cook for about 5 minutes more. Now be sure to vote for me. Every vote is registered to win $500! Score!!! To vote for me and to check out the other delicious recipes you can go here. To find out how you can make the switch you can check out the Whole Grain Council website. They have starter steps to get you on your way. You can get more information here. Because I am a good person, and truly believe in good eats, here is the list of bloggers and dietitians that are also in the contest. I truly would love your vote! So please vote for me, you could win $500 and you would also be putting a smile on my face. 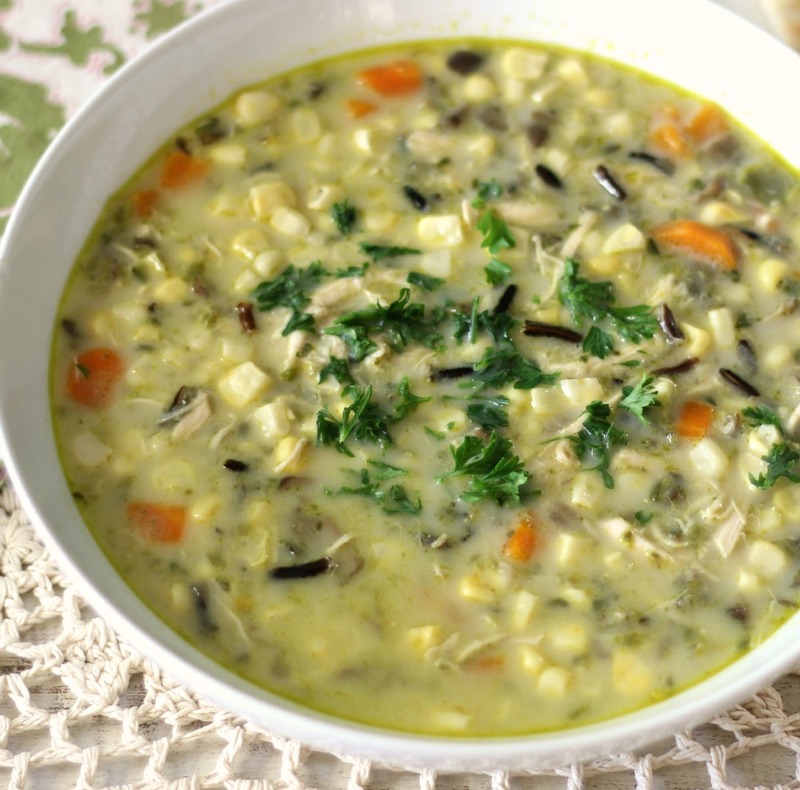 Here is the web address to vote for my Corn Chowder with Wild Rice. Thank you so much Marlene! We need to get together soon. Looks delicious! Do you think this can be put into individual portions and frozen? Hard to describe how perfect this soup is. I pinned it for later. 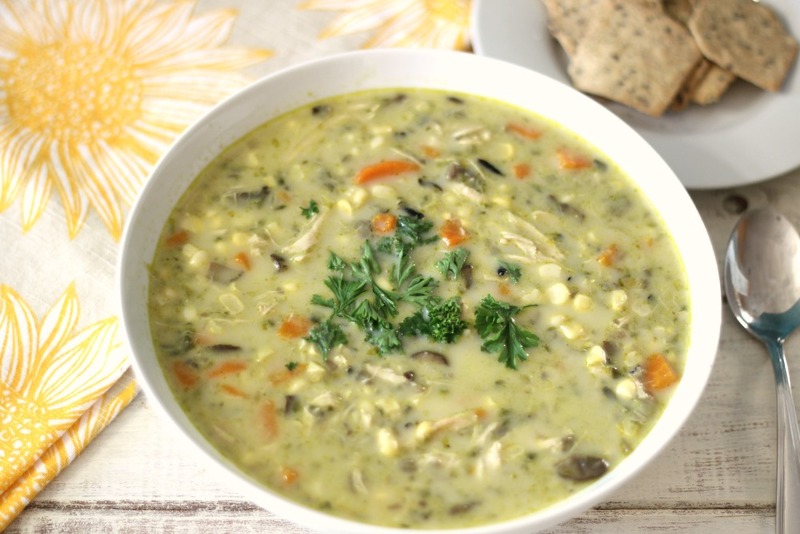 Today was ‘later’ when my 8 year old looked through my Soups board, saw this, read the recipe and told me that he wanted your soup for dinner. It is FANTASTIC!! I shared some with friends who had the same raves that we had. LOVE, LOVE, LOVE!! Hi Betsy! How sweet that your 8 year old picked out my soup from your board. I am so happy that you and your friends loved it. It’s one of my favorites too. Thank you so much for the compliment, you made my day. Hi, I’ve been using your recipes for about 2 months now and have been loving everything, but this is the first one that didn’t turn out quite right for me. I halved the ingredients but otherwise followed all the instructions and after maybe 45 minutes or so there was no liquid left in the pot. Should I have covered it while simmering, or maybe reduced cooking time? I ended up pouring another cup of chicken broth in, along with the half and half. The result was still delicious but less “soup” and more succatash. My wife loved it so I’d like to make it again but this time do it right. Thanks!